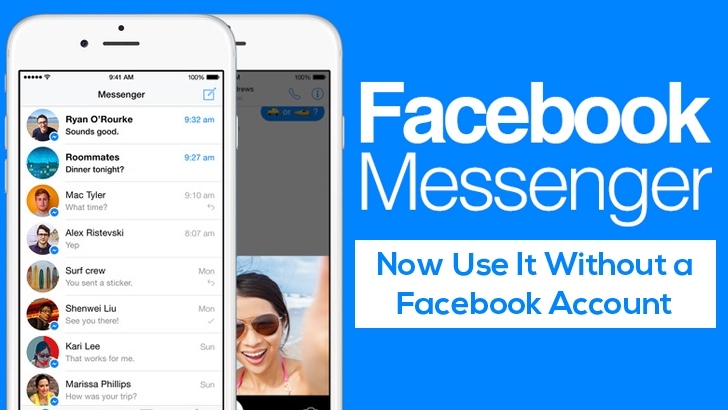 Don't have Facebook account but want to use its Messenger service? Then go for it because Mark Zuckerberg wants even the people who hate Facebook to use the social network's separate Messenger service. So, you no longer need an active Facebook account to make use of the Messenger service, all you need is just your name and phone number, the company announced today. Facebook is giving a new "Not On Facebook?" option on the sign-up screen for its messaging app, which allows anyone to create an account for the Messenger app using his or her first name and phone number. Facebook currently started offering this option for people in the United States, Canada, Peru, and Venezuela; the rest have to wait for the feature. Users with non-Facebook accounts will enjoy the same Messenger features, including voice and video calls, payments, stickers and GIFs. The only and major difference for non-Facebook users will be features that rely on the network of Facebook friends. This simply means the Messenger app will rely solely on your phone's contacts in order to find friends on the service. Moreover, Non-Facebook users will not be able to access their messages on the web. So far, it is unclear when Facebook Messenger will open its new sign-up option to more countries, but the move clearly indicates that the social network giant is increasingly moving forward to make the Messenger its own standalone platform.